Is contemplation right for me? Attentiveness in contemplation – what is it? Published April 18, 2014 at 1024 × 683 in How presence alleviates stress and anxiety – Part 2	~ Post a comment or leave a trackback: Trackback URL. Many thanks to Steve Evans for this wonderfully immediate composition. License details: http://creativecommons.org/licenses/by/2.0/deed.en / No modifications made. Lovely one. Children are much on my mind with the Gaza conflict – I cannot just accept we humans can be so brutal to our own young, but well, brutal to everything, I suppose. How will we evolve? I don’t know. I guess one person at a time. I hope I don’t have to come back to planet earth again, don’t think I want to. Meanwhile, I am doing my best . . . I will try for photos like this on my next visit to India, although this one looks like a studio photo. 🙂 Eve. Yes, the current Gaza conflict is utterly disgusting and I have had several discussions about this with others. As this isn’t a political blog, I won’t go into that aspect, save to say, the U.S. must stop funding the Israeli military if it operates, as it is yet again, in this manner. As for Steve’s photograph, I’m not sure that it is a studio shot, as that isn’t his thing. He is a photojournalist and cultural researcher who travels very widely and is interested in ethnographic studies. Social documentary photography is his specialism. All best wishes as ever and thank you for commenting further. P.S. In fact, if you look very closely into the reflections on the girl’s eyes, you can see that it is almost certainly not a studio shot. Clearly, the girl is not au naturel make-up wise, and the shot may have been Photoshop manipulated. Still, I like the serenity and immediacy of the composition. Wow, what a captivating photo . . . Look into those eyes . . . 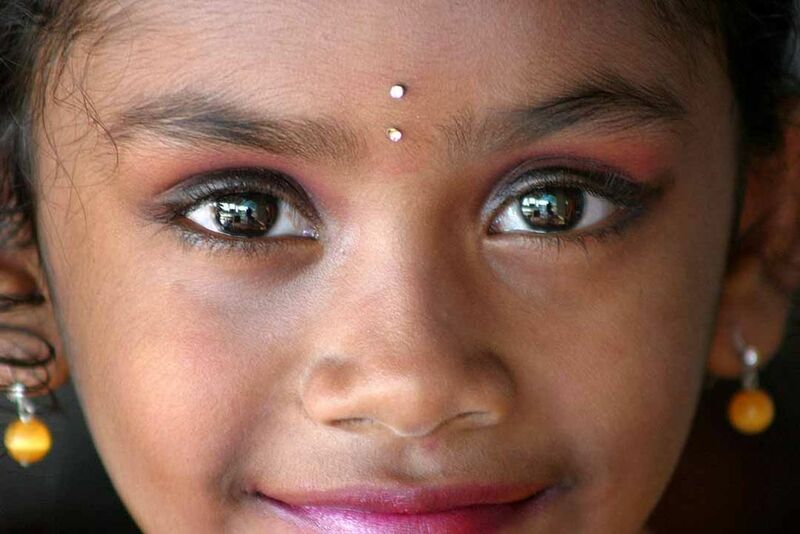 I went to Sri Lanka in 1995 and I found the people so very friendly; each had a smile. Many thanks for sharing Steve Evans’ photo and link. Thank you for looking and for commenting Sue. I greatly appreciate it as I am very particular about the visual side of the site, and hope to please visitors with what is displayed alongside the text. Thankyou Robert, it is I think too, and I like that Steve the photographer has managed to capture himself in her eyes. Thankyou very much, Clare, on behalf of Steve. I’m not sure if the venerable swami understood my little joke about his elbow! No, but he was very polite about it⌥ I like the kind manner that flows through his written words. He seems to be a very content man.